can be caused by your .asp file being in an UTF-8 (with signature) encoding. 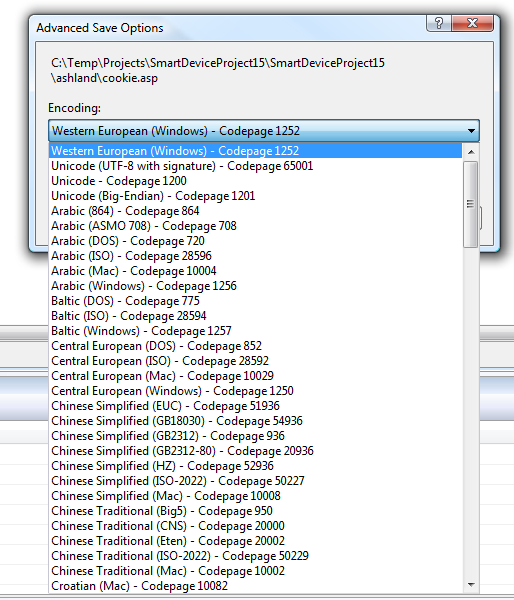 In the “Encoding” drop-down box, select “Western European (Windows) – Codepage 1252” (this is equivalent to ANSI) or select “Unicode (UTF-8 without signature) – Codepage 65001”. 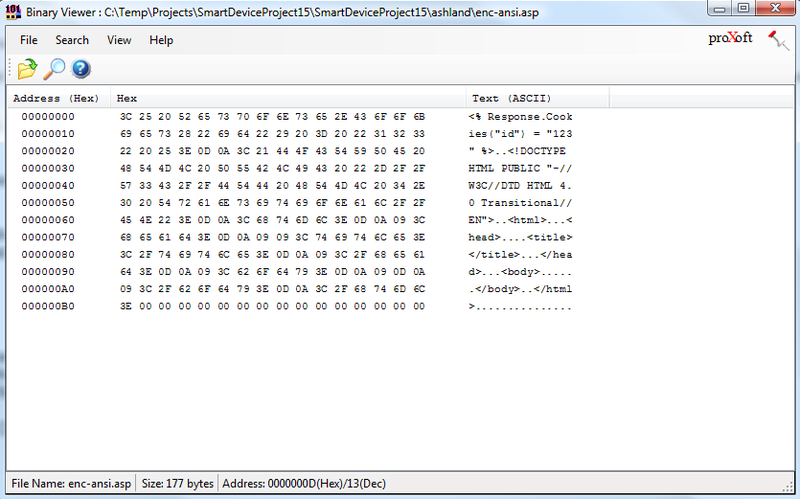 If you don’t have Visual Studio, you can use Notepad++ to convert your .asp file to ANSI. To do so, you go to the main menu of Notepad++ and click Encoding > Convert to ANSI. Note how the <% Response.Cookies("id") = "123" %> script is located at the very top of the page. This is where the script should be since all scripts that append data to the HTTP Headers (cookie info is sent via HTTP Headers) need to be executed prior to all other data UNLESS if the ASP server’s Response.Buffer is set to true (<%response.Buffer=true%>). Well, my server’s response buffer was set to true and my script was located at the top of the page, so what gives? Why was I still getting the error? What happens is UTF-8 puts special characters in the first bytes of a file indicating to an editor that it is UTF-8. When our ASP interpreter parses out a page, it sees those UTF-8 characters and (unfortunately) doesn’t know about UTF-8 and assumes its ASP body that needs to be sent out. Once ASP body has been sent, you’re not allowed to send HTTP headers anymore, which is why the Expires=-1 wasn’t working. I was curious about the “special characters in the first bytes” (I assume the special characters are the “signature” of the UTF-8 encoding) that UTF-8 (with signature) prepends to the data, so I used Binary Viewer. 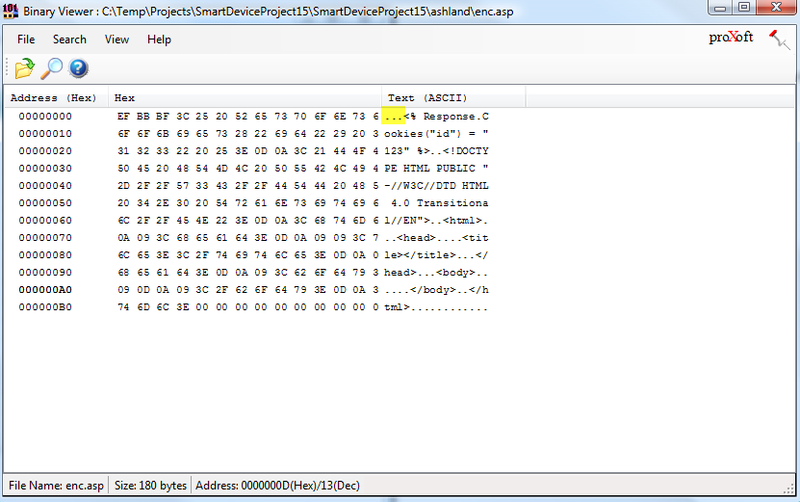 Below is a screenshot of the binaries of the UTF-8 file and the ANSI file. 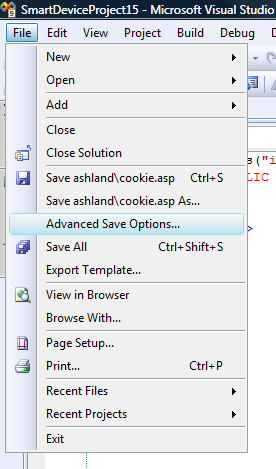 Note: If you have Visual Studio, you can view the binary of your file using the built-in “Binary Editor”. To do so, in the Solution Explorer, right-click the file you want to view, select “Open with…”, then select “Binary Editor”. UTF-8 – Notice the “extra” data prior to the call to <% Response.Cookies – that extra data is what is causing the error to occur. I am experiencing strange behavior in my .ASP web page that is running on Windows CE (CUWIN5500 device). For an unknown reason, the code above will (sometimes) crash the entire OS – specifically, the device freezes up to the point you cannot even move the mouse around. The only way to rectify the freeze is to reboot the device. I do not know what is causing this problem to occur and I log it here in this post for future reference.